"This book describes the history of the electron, the "almost nothing", from the days it was unknown until our present time. Luckily the author writes in a language that any layman can easily understand, without boring the expert either. Thanks to clear explanations and many illustrations, the functioning of magnets, cathode-ray-tubes or transistors becomes less of a mystery. However the technical aspect of this enormous development over the last century is only one part of the subject. We probably all remember from our school days what a Faraday cage is, what Ohm's law says or that Edison might have something to do with grandpa's gramophone. But do we know anything about Mr. Faraday, Mr. Ohm or Mr. Edison; their life, personality, character? 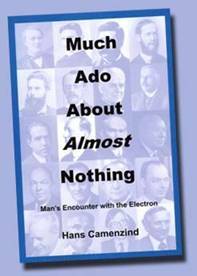 Now here is what makes this reading so interesting: Hans Camenzind tells us all about more than 30 people whose inventions and discoveries contributed so much to the growth of the little "almost nothing" to the prominent role it plays today. Suddenly these persons come alive and we read about their achievements, ambitions and frustrations, successes and tragedies. And this very human side also includes some humorously presented little episodes. All in all, this is an enjoyable and fascinating book and I believe I will not be the only one to have read it from A to Z in one go." In stock at Amazon.com or Barnes & Noble.com.